Experts say housing market will rebound after stock market does. BUYERS snapping up homes in recent weeks may be jumping into the market way before it has reached the bottom, according to new research. Real estate consultancy DTZ is tipping a gradual property market recovery only from the middle of next year. The firm bases its view on a new report from its Asia forecasting unit. This shows how a slump, or recovery, in the stock market is always mirrored in the property market, but only after one or more quarters. Or to put it more bluntly: The housing market will not recover until at least one quarter, or even a year, after the stock market recovers. And as any stock market investor knows, the Straits Times Index (STI) is well down from its 2007 peak, even though it has risen slightly recently. ‘The STI reflects people’s view of the economy so its recovery will really depend on clear signs of an economic recovery,’ said DTZ’s senior director of consulting and research Chua Chor Hoon. Experts have long noted that a recovery in the stock market typically precedes an economic recovery, with a recovery in the property market after that. ‘It’s all co-related in one way or another. The stock market is usually the earliest indicator but it’s not hard and fast… its timing might be off,’ said Daiwa Institute of Research analyst David Lum. Last week, the Government said it expects gross domestic product to contract by 6 per cent to 9 per cent this year, well up on an earlier forecast of a 2 per cent to 5 per cent contraction. 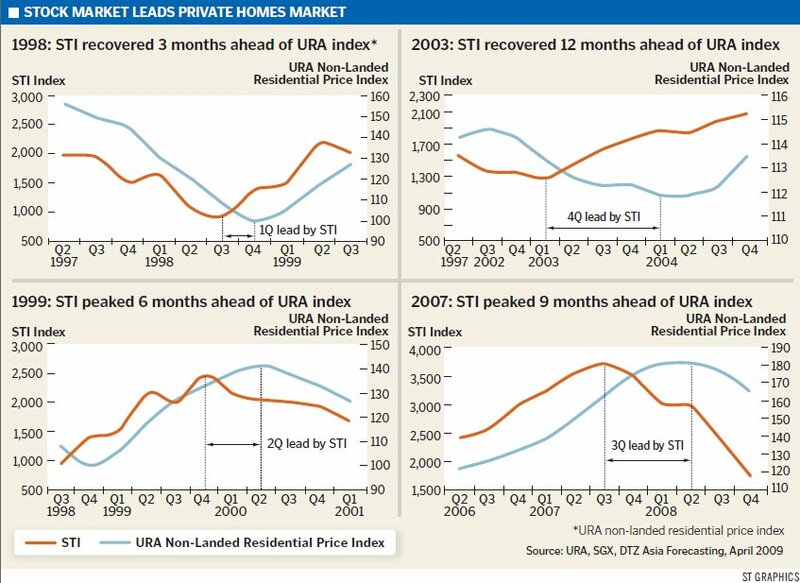 DTZ’s study also underlined the high levels of unsold stock held by developers – another drag on prices and an eventual recovery. The report indicated that the residential market thus has a higher chance of bottoming out only by mid-2010 and then staging a gradual recovery. Mr Lum said the property market has already started to correct so anyone who bought recently would not have purchased at the peak. If prices fall further, these people will not be happy, but they would have been comfortable with the price levels they bought into and will not be overstretched as they would have thought about their purchase, he added. DMG & Partners Securities investment analyst Brandon Lee believes the mass market segment would have bottomed out at around $550 psf to $600 psf so recent buyers may not have much to worry. Those who bought prime homes, however, may have gone in too early. 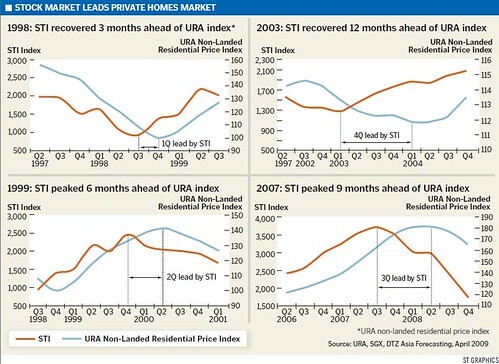 Mr Lee sees the property market bottoming out only in the first half of next year. ‘Crises in the past have lasted for six to eight consecutive quarters and we are only half way through,’ he said. The property market remains largely weak, even though recent sales of new private homes brought a glimmer of hope to the market. First-quarter new private home sales hit 2,660 units, representing 62 per cent of all new private homes sold during the whole of last year. Whether it was pent-up demand, discounted levels or other factors, sales did reach very high levels given the recession. But most sales were in the mass market segment, which consultants tip to be the best-performing sector this year. Demand for prime and high-end homes remains sluggish. ‘Since when does a ‘rebound’ in one segment signal a recovery for the entire market?’ asked Chesterton Suntec International head of research and consultancy Colin Tan. ‘The greatest danger we face now is complacency…If it were an ordinary recession, I can understand why we are starting to call this period of optimism the first signs of a recovery, but it is not,’ said Mr Tan. How to calculate your CPF 35% stock limit? Use a Calculator! This entry was posted on Friday, April 24th, 2009 at 2:39 pm and is filed under Housing, Singapore Watch ver 2.0. You can follow any responses to this entry through the RSS 2.0 feed. You can leave a response, or trackback from your own site.